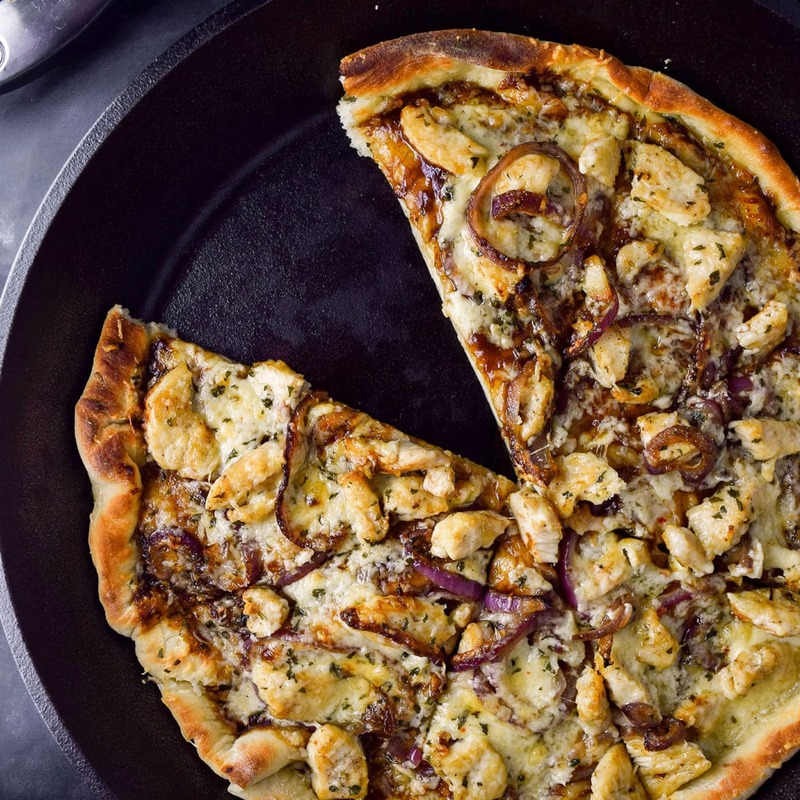 BBQ chicken and pepperjack cheese pizza made in a cast iron skillet. I’ve always wanted to try pizza in a cast iron skillet. Why, you ask? It’s the most versatile pan in the kitchen world so why not push the limits and see what it can do? 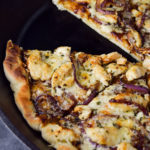 For skillet BBQ chicken pizza, I used a monster 15 inch Lodge cast iron skillet. I’m a big homemade pizza guy, and I’ll be honest, I swear by my pizza stone. However, the cast iron skillet delivers different, but equally delicious results. As an aside, I think the pizza stone gets a bad rap. I can’t tell you how many articles I’ve read where people try to tell me I’m crazy for using a pizza stone, or that I don’t need them. 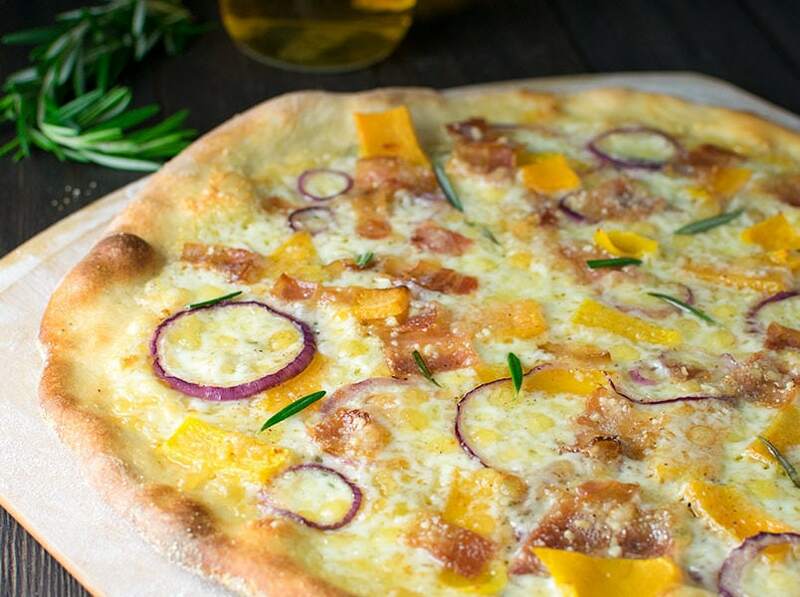 I will tell you there are several great ways to make pizza—a pizza stone being one of them. I think the big difference when making pizza in a cast iron skillet is the crust. A pizza stone is preheated in the oven at 500 degrees giving you a very hot surface to cook your pie on. Much like a hot brick oven, it cooks the crust very quickly, giving you crispier results. Cast iron on the other hand starts out room temperature, cooking the crust more slowly, giving you fluffier, softer crust. I think it’s a matter of preference. Both fantastic, just different. Cast iron is going to quickly heat up and retain heat much better than a standard baking sheet. I think this eliminates any chances of soggy pizza. If you’re making deep dish pizza, than there is no better tool than your cast iron skillet. 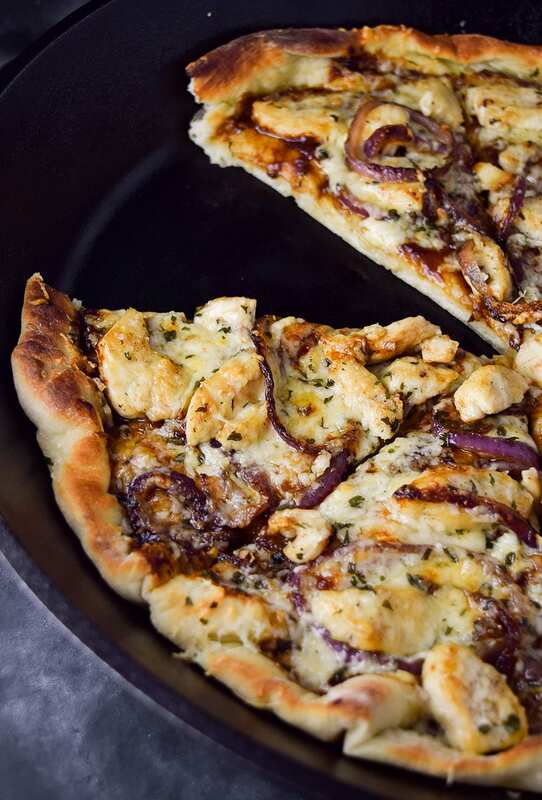 My BBQ chicken pizza consists of grilled chicken, BBQ sauce, caramelized red onions, and cheese. My personal twist is freshly grated sharp cheddar and pepper jack cheese. A slight deviation from your typical mozzarella cheese. It delivers slightly sharper flavors with a very mild zip. 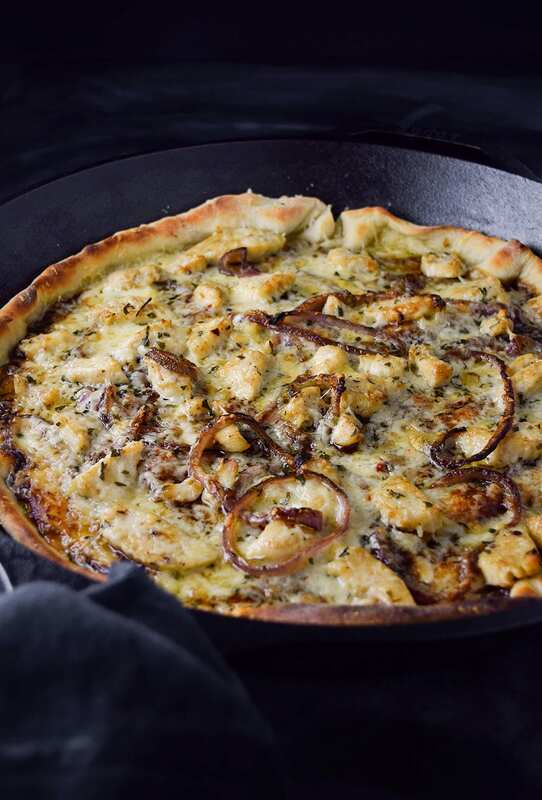 That cheese combo paired with chicken and caramelized onions is out of this world. I swear by caramelizing the onions. This consists of lightly sautéing the onions in a little butter before topping your pizza. 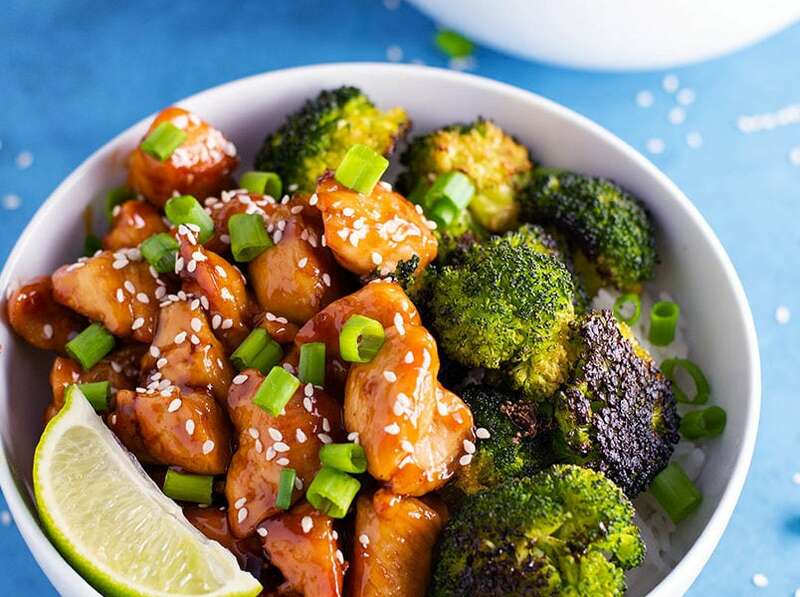 It’s easy to do and it brings out the onion’s natural sugars and flavors. After all, this is gourmet pizza (and I think it makes a big difference). Meanwhile, roll out the dough into a 12 inch crust and set aside. In your 15 inch cast iron skillet on medium-low heat, caramelize the onions by lightly sautéing with butter, flipping occasionally. Cook until golden brown and soft, about 5 minutes. Remove onions from the skillet and set aside. Turn up the heat to medium-high and sauté the chicken in the cast iron skillet until fully cooked, about 5-7 minutes. Season with salt and pepper, remove, and set aside. Quickly rinse the skillet in cool water and wipe dry with a paper towel, spray the inside evenly with cooking spray and set aside. Transfer the dough to the skillet, leaving crust 1/2 an inch up the sides of the skillet. Sprinkle with oregano if desired. Evenly layer BBQ sauce and top with chicken, caramelized onions, and cheese. Bake for about 10 minutes or until crust is golden and cheese is fully melted. Remove from the oven, let cool, and serve. This was of course, amazing! Very easy to make. I only bought a 10 inch skillet so I need to expand my inventory if we’re going to keep going here. Learn from my mistake, use the bigger skillet. Also, I had about 20 oz. of pizza dough and thought, “well, it will be good thicker”. My problem is always rolling out pizza dough, we have a love hate relationship and I would love some pointers. It was delicious. Surprisingly for such a thick crust, it still cooked in under 11 minutes at 500 degrees. There will be a do-over with a thinner crust and a bigger pan. I might even get daring and try different toppings. I think four people could have easily shared this and left full. Lesson learned! I truly enjoy reading your blog, normally when I find a recipe, I scroll right to the bottom and start cooking. (for obvious reasons if you’ve read other blogs) Yours are super informative, instructional and have great tips. Thanks Jennifer – I’ve always been a fan of thinner crust personally. I will remove some if I find I just have too much. It takes patience, But always roll pizza dough from the center out and work your way around in a circle so it stays even. Also, it helps if the dough doesn’t have too much flower. Sometimes if it sticks to the counter just a little bit, it helps stretch it out. Thanks again for your kind words and all the great feedback!